This weekend I went along to the truly fantastic Wassail Mari Lwyd event in Chepstow which provides an excellent showcase for one of Wales' oldest folk customs, 'The Mari Lwyd'. The Mari Lwyd or Y Fari Lwyd - meaning 'Grey Mare' or 'Grey Mary' is a midwinter / New Year tradition in Wales, linked to the house to house wassailing 'good health /luck bringing' custom. The Mari Lwyd is essentially a large puppet head, made from a mare's skull mounted on a pole, over which a white sheet is draped. Cloth ears may be sewn on to the sheet and ribbons and bells are attached as decoration to the protuding skull. Coloured glass or other shiny material is fitted into the eye sockets. The jaw is usually wired so that it can be operated to make it 'snap' at people. The skull on the pole is carried and 'operated' by a man hidden under the sheet. 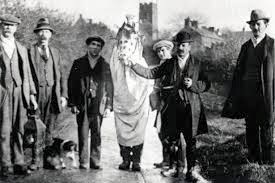 The Mari Lwyd is then 'lead' by its reins or a chain in a procession from house to house. Parties accompanying the Mari Lywd, often dressed in costume or disguise with masks or blackened faces, chanting, singing or shouting insults or exchanges at each door visited, in the hope of being invited in and given food and drink. Entry is not guaranteed as the occupants of the house throw songs or insults back in a 'contest' or 'pwnc'. The insult/song contest sometimes goes on for a very long time until the Mari gets invited in. On entering the house the Mari often proceeds to wildly chase any girls present snapping at them with its jaws until a gift of food and drink (and/or money) is offered. The tradition of the Mari Lwyd is pre-Christian. 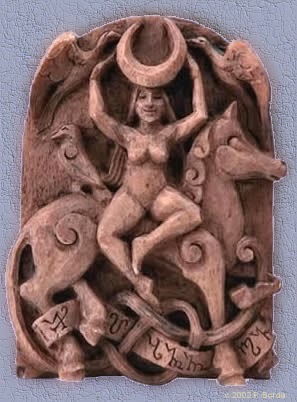 It has been linked with the horse goddess Epona (her name meaning'Great Mare'), who features in Gaulish,Celtic and Roman inscriptions and also with the Celtic goddess Rhiannon, who has a strong association with horses. An interesting aside to this, is that the famous Fleetwood Mac song 'Rhiannon' is based on the Mabinogion legend of Rhiannon who, in the story of her pursuit by Prince Pwyll before she marries him, is featured riding a pure white horse with magical qualities. Another story is that the Mari Lwyd represents the horse turned out of the stable in Bethlehem to allow the Virgin Mary a place to give birth to Jesus. The horse has since roamed the countryside looking for alternative shelter. 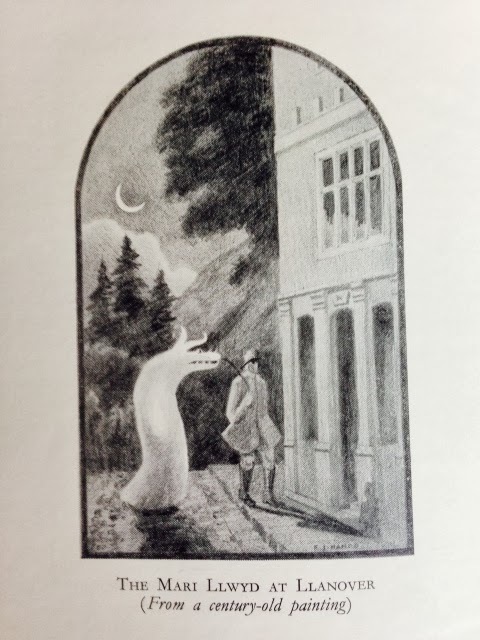 This story is perhaps reflected in the alternative translation of the Mari Lwyd as 'Grey Mary', rather than 'Grey Mare'. Abergavenny writer, Chris Barber, refers to this story and feels that what started as a pagan custom, may have been taken over by the early Christian church to form a 'cult' linked to the Virgin Mary which died out during the Reformation. In folklore the horse features as a symbol of strength and fertilty. White or grey horses, real and mythylogical (such as pegasus and unicorns), and other animals such as white hart (deer) or white hares, were seen as having 'special', 'sacred' powers and the ability to cross to, or communicate with the 'underworld'. Such animals have been revered in folk stories, songs and art for thousands of years.The most striking examples of white horse symbolism, can be seen as giant figures carved into chalk hillsides around the UK. The oldest of these 'chalk horses' is the Uffington White Horse in Oxfordshire, which is 3,000 years old. However, most of the other chalk horses that are still visible have been created in the last 300 years. The use of an animated, dead horse's skull in the Mari Lwyd ritual, is symbolic with death and rebirth - and its use in a mid-winter wassailing custom, synonymous with the 're-awakening' of the countryside's fertility after winter. Customs involving horse skulls, horse worship or horse sacrifices have featured in many cultures around the world. In the UK our aversion to eating horse meat may well be linked to old customs like the Mari Lwyd which feature the horse as a 'special, 'sacred' animal. Other areas of the UK have traditions at different times of the year using symbolic horses heads which include 'The Hooden Horse of Kent', 'The Padstow Obby Oss','The Poor Owd Oss of Nottinghamshire' and 'Soul Caking' in North Wales and Cheshire. "With regard to the pastime of the horse's head mentioned in your last paper, I am happy to say it continues to delight young and old every winter, in the parts of Gwent about Pontypool, Govilon, Abergavenny and the mountainous district generally. The parties going about with the horse's head are denominated Merry Lhwyd, who sing Welsh songs and dance, the great amusement consisting in the spectre horse's antics, he being well skilled in frightening the maidens, who, peeping through the half opened door are put to flight by his gambols these most interesting relics of past ages, are so little prized that they are scarcely known to exist by the higher classes of Wales." The custom lost favour somewhat, due to the growth of the Welsh Methodist Churches and Temperance movement during the Industrial Revolution, when customs associated with revelry and drunkeness were frowned upon. Christmas Carolling became far more common and Mari Lwyd practices faded away to all but a few villages during the early part of the 20th century.Writing in 1951, Fred Hando in 'Journeys in Gwent', discusses the Mari Lwyd in Caerleon with some old residents of the village, who refer fondly to the tradition that had not taken place for 20 years. In more recent times a re-surgent interest in folk traditions has seen the revival of the Mari Lwyd in some parts of Wales. An initiative by Trac - Folk Development Wales has provided funding to educate children and communities about the Mari Lywd to preserve the tradition. Watch a video about this initiative (worth watching to see some really great moves by the 'mare' in this). 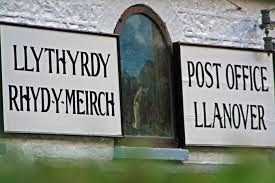 Examples of Mari Lwyd groups operating in South East Wales include Cowbridge, Llantrisant (near Maesteg), Llanvihangel Tor Y Mynydd and also at St Fagans (National Museum of Wales). Chepstow's Wassail Mari Lwyd event has for the last few years, combined several midwinter customs such as Wassailing, Mumming and The Mari Lwyd, into a January festival day featuring these old traditions albeit in a rather less 'traditional' but high profile way, this is helping to preserve the tradition of the Mari Lwyd. 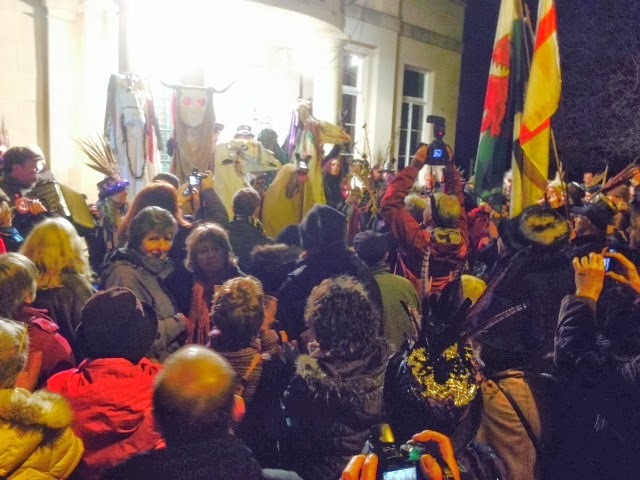 Watch a video of the Chepstow Wassail and Mari Lwyd 2013 (my photos from the 2014 event below). An incredible eight Mari Lwyd's in one place! The Gloucestershire 'Broad' or Bull traditionally accompanies the Gloucestershire Waysailers (the local word for wassailing)! A new annual Mid-Winter 'custom' linked to the Wassail Mari Lwyd festival has begun in Chepstow. A large crowd gather to follow the Mari's across the River Wye for a meeting between the Welsh and English, at the centre of the old Wye Bridge, - the two sides challenge each other - there is much 'roaring' and noise, it could be war but thankfully peace reigns - the toast of 'WASSAIL!' is shouted on both sides and everyone shakes hands, kisses and makes friends!! Then it's back across the bridge to Chepstow with our new friends from England! The Mari's group for the 'Pwnc' at the entrance to Chepstow Museum - songs are sung, verses are chanted on both sides of the door and eventually the Mari's are granted entry - plenty of mulled cider awaits them! What, ho! is your request - demand? To the Mari Llwyd from you! With milk, cream cakes and flummery!